Gear weight came in at around 1.9kg before I added tools (500g), food and two water bottles on the bike. I had a Exposure Enduro on the bars, along with a GPS and back-up paper maps stuffed into a jersey pocket with some more food. The bike weighed about 34 lbs or so with food and water on board, which I was pretty pleased with. We rolled out from the start just after 10am, and I found myself at the front and setting the pace almost immediately. The first climb up through the forest was long and a shock to legs that had neither warmed up properly or turned the cranks since the Welsh Divide. Once out of the forest there was little respite as route required a long push up a steep grassy bridleway. Eventually, I reached a short linking piece of tarmac before heading off along more bridleway towards Hafren. This was varied in nature, sometimes rideable, often not but I knew once I cleared this section the course opened up onto forest road and would allow me to get into a rhythm. At about 30km, I was caught and passed by Kevin Roderick and we exchanged places for a good while as the terrain favoured either geared or singlespeed. With Hafren dispatched, followed by the section past Nant Rhys bothy, I arrived at the first long road section into the Elan Valley. It was uphill and into the wind. Kevin was a good way off in front of me, but with a long road climb I managed to reel him in just as we turned off road again. At this point I noted I was one quarter of the way through, in a bit over four hours. At the five hour mark we were nearing Claerwen Dam. It was time to stop for a bit of food, as up to this point my GPS was saying my total time and moving time differed by only ten minutes. At the food stop, I looked south into the hills to see where the return route came over the top – this is a notorious bit of bridleway that degenerates into bog quickly if you stray off the correct line. But, I had a long way to go before I would get to the other side of it. Claerwen Reservoir track is long and twisting. It is also rough and punishing on the upper body and my legs were still coming to terms with the severity of the opening sections of the route. I struggled to match Kevin’s pace along here, where gears and suspension allowed him a slight advantage on the rough slightly downwards gradient. The first food stop was at Pontrhydfendigaid, and the clock was ticking if we were to get there before it shut at 5pm. It turns out that rushing to get there early was a waste of time – it shut at 2pm. Whilst I had food with me, I had dreamt of milkshake, a can of Coke and a pastie of some sort. The Red Lion in the village was open, filled with glum faces from Wales’ earlier defeat in the RWC semi-final at the hands of France. I got my Coke, some crisps, nuts and a sandwich. I totted up the calories – about 1200. We left the pub at 5pm after a 30 minute stop and headed into Twyi Forest, where a very long forest road climb lay ahead of us. I’d ridden this on the Welsh Divide on a fresher pair of legs, so was quite pleased to have made it up in one go and, this time, ahead of Kevin. The route stayed in the forest a long while and we generally continued to exchange places from time to time, but usually always remained in sight of each other. Darkness fell as we went through Cwm Berwyn Plantation, and it was fully dark by the time we arrived at Ty’n Cornel hostel. The lights were on and they were too inviting to ride past. We made a domation to the Trust who look after it and the warden there made us a cup of tea. After another 30 minute break, we tackled another steep push up a gravel track past the top of the Doethie Valley. Any attempt to dry feet out of the hostel were soon undone by the numerous stream crossings and track-wide puddles that appeared on our route. With some relief, we reached another long road section, but this one offered little opportunity for rest as it contained the Devil’s Staircase, with its 25% gradient. I pushed right from the bottom and watched as Kevin’s light faded into the distance. I think at some levels it was less effort and nearly as quick to push and not need a rest at the top than it was to ride, as I soon caught Kevin again on the other side. More favourable road gradients finally brought us to Coed Trallwm. It was decision time: either rest up here and get up early (like, 4am early) for the final leg back to the start to ensure a sub-24 hour finish, or push on through the night and forego sleep entirely. We decided on the latter. It was clear and cold now, and the clear was in our favour for the next section of open hill or bog I referred to earlier. I’d put on my leg warmers and waterproof to fend off the chill air, and we rode the steep fireroad through the forest and eventually out onto the hill. I found a good line to push up to the cairn, and some bits were occasionally rideable. The line was tight amongst thick grass or scatter rocks and while forward progress was steady, the toll both mentally and physically was high. We made a small navigational error towards the end that cost us 10 minutes or so while we back-tracked. It was about midnight now, and the effect of the last 14 hours of riding was showing. Physical reactions were slowing, it was difficult to sustain hard effort for any length of time on the climbs. It was also bitterly cold in the valleys. We made a few small stops for food. Both of us could have fallen asleep at any of these if we’d have just laid down. Without knowing how long the final section back through Hafren would take, we were still inclined towards just getting the whole thing done than stopping and having to wake early and cold in a few hours. The route eases after Rhayader. A long section of lane work followed the river up the valley until we reached Llangurig. Again, Kevin had and edge here. New-found strength or gears or just the desire to get it over with allowed him to cover the ground faster than I did. I caught him again at Llangurig, where I was prepared to forego a rest and get through Hafren: the last section of off road. My memory is a bit hazy for this bit. I remember lots of gates and a long fireroad climb that I pushed. I was so tired I felt like I could have fallen asleep standing up. Eventually, the road appeared before us and my senses livened up a bit. It was mostly downhill from here. No sting in the tale: the route was hard enough as it was. Kevin and I arrived at the finish together. The clock said 3:28 AM. Total time of 17 hours 23 minutes. I awoke at about 9am later that morning. I couldn’t quite believe we’d done it in one go. 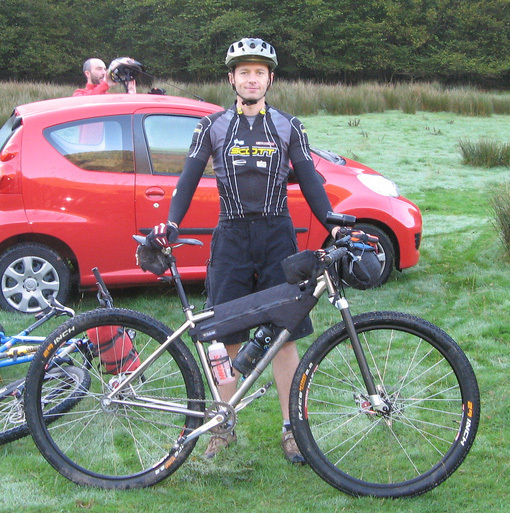 The terrain was seriously tough in many places, and my choice of singlespeed I felt was not the best at times. We sat and chatted with a few others who’d cut their route short the previous day, and waited for Stuart and Dee, the organisers, to serve up the food. 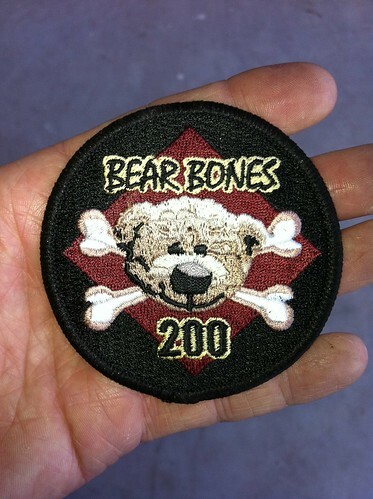 Finally, after 10am had passed, Stu presented the sub-24 hour finishers with their black Bear Bones 200 badges. There’s only two of these in circulation. Kevin has the other one. Well Done, will hopefully make this event next year! Great stuff Ian, and a great write-up! Well done matey, looks like the 24hr rider in you isn’t totally dormant yet! I have been to Pontrhydfendigaid a few times before, the first time I too was relying on food at the place, never made that mistake again as I never see anything open. Its like the general store at Peak Forest in the Peak District, it never ever seems to be open.